A joint venture of Boeing (NYSE: BA) and Textron‘s (NYSE: TXT) Bell Helicopter subsidiary has secured a potential $143.8M firm-fixed-price contract from the Defense Logistics Agency to engineer and provide logistics support for the U.S. military’s V-22 Osprey tiltrotor planes. The Bell Boeing Joint Program Office will deploy field personnel and support equipment as well as perform maintenance planning, training and site activation for V-22 squadrons worldwide, Boeing said Friday. The U.S. Navy, Marine Corps and Air Force will receive the aircraft services under the firm-fixed-price requirements contract. 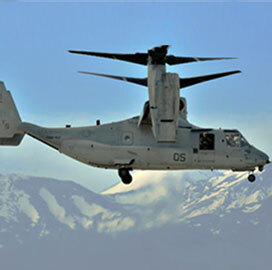 “Bell Boeing is excited to bring our [original equipment manufacturer] expertise to the V-22 fleet,” said Pat Walsh, former admiral and vice president for Navy and Marine Corps services at Boeing. Work has a base period of 11 months and could extend for an additional four years if all options are exercised. The contract will expand work Bell Boeing has performed since 2008 and center on mission readiness and aircraft maintainability for the tiltrotor aircraft. The team received a potential $4.2B modification in July of last year to manufacture V-22 variants for the U.S. military and Japan.